A Letter: The End of an Era? As you may recall, back in July of 2008 I sent a letter to a bunch of politicians, including a then Senator Barack Obama, about the situation in Zimbabwe. 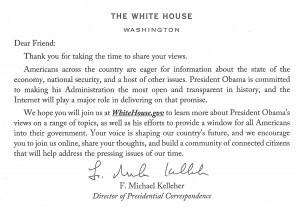 After receiving no response from any of them, I sent a new letter to President Barack Obama in January 2009, I also included the original letter. For those of you who missed some of this, visit here and here if you want to get caught up. Also, in January 2009 I sent a letter to Hillary Clinton in the State Department about Zimbabwe. I didn’t publish the letter on the website because I didn’t want to bore you all to tears with my Zimbabwe letter drama. Americans across the country are eager for information about the state of the economy, national security, and a host of other issues. President Obama is committed to making his Administration the most open and transparent in history, and the Internet will play a major role in delivering on that promise. 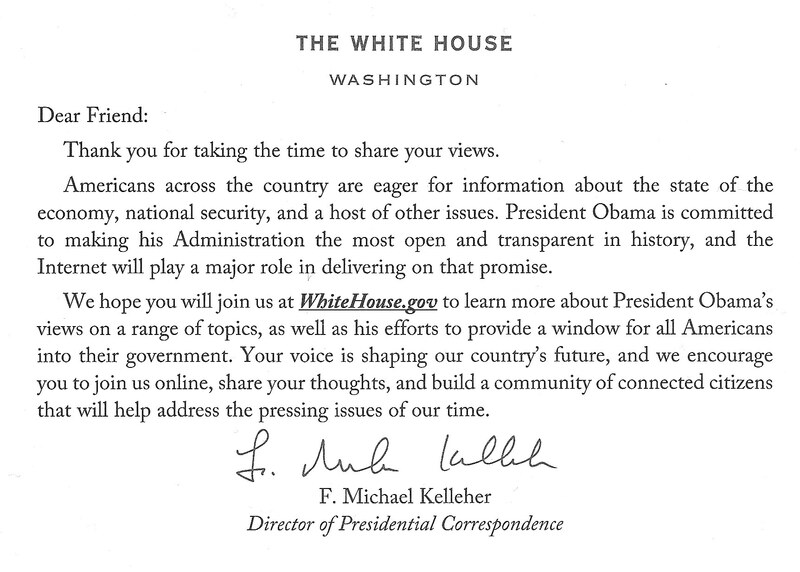 We hope you will join us at WhiteHouse.gov to learn more about President Obama’s views on a range of topics, as well as his efforts to provide a window for all Americans into their government. Your voice is shaping our country’s future, and we encourage you to join us online, share your thoughts, and build a community of connected citizens that will help address the pressing issues of our time. So while some Americans are getting personal responses (Really! Here’s the link! ), I got perhaps the lamest form letter imaginable. I bet this kind of thing never happens to Perez Hilton! Of course, I doubt Perez Hilton knows anything about the political and economic situation in Zimbabwe. Perhaps that’s not the best example. I didn’t expect a personal response, but I had hoped for something a little better than my post card. I took the time to put pen to paper because that’s how strongly I feel about this issue. I just thought that in a time where most people express their outrages in 140 characters or less on Twitter, that a well thought out letter would merit a little more respect.